The Growing Stage is the 3rd theatre in the world to be granted permission to put on this special musical adaptation of the famous 1964 television special. I'm having a blast! The show is adorable, perfect for the whole family, and sure to connect with anyone who has ever felt like a misfit. The show runs: Nov. 23rd - Dec. 23rd, 2012 at The Historic Palace Theatre in Netcong, NJ. "It is a perfect mix of nostalgia for older audience members and Christmas wonder for those young." "Charming and funny is PJ Schweizer." "Schweizer has a humorous voice he uses to make Hermey sound elfish and nerdy at the same time. He is delightful and has good timing with the funny situation he is in." Rudolph the Red-Nosed Reindeer opens at the Growing Stage!! Today, I'm dawning the pointy hat to portray Hermey the elf in the Growing Stage's production of Rudolph the Red-Nosed Reindeer, based in the beloved 1964 television special. This is only 3rd production of this stage adaptation that the producers of the TV special have allowed to be performed! Set in a magical, holiday world and with all lots of holiday hit songs, including "Rudolph the Red Nosed-Reindeer," "Holly Jolly Christmas," and Silver and Gold." I'm having a blast! The show is adorable, perfect for the whole family, and sure to connect with anyone who has ever felt like a misfit. Nov. 23rd - Dec. 23rd, 2012 at The Growing Stage's Historic Palace Theatre in Netcong, NJ. A Very Furry Christmas opens at Sesame Place! Our second annual Christmas season is even better than last year. Enjoy more breath-taking light displays or grab a hug from one of your favorite furry friends in new adorable Christmas outfits. Hop aboard our ALL NEW Christmas Train ride, The Furry Express and tour the Twiddlebug Chocolate Gingerbread Factory. Then, grab some of the delicious cookies to take home with you. Christmas is fast becoming every one’s favorite time at Sesame Place. It’s perfect for the whole family and sure to give even the “grouchiest” heart a warm and fuzzy feeling. The Growing Stage is the 3rd theatre in the world to be granted permission to put on this special musical adaptation of the famous 1964 television special. I will be portraying Hermey, the odd little elf who instead of making toys, longs to be a dentist. He ends up befriending Rudolph as they are both "a couple of misfits." This is marks the 5th production and version of Peter Pan I have done and while it was a mental adjustment to not be playing the Boy Who Wouldn't Grow Up I've had a terrifically fun time playing Jukes, the pirate! This version premiered in 1985 with adaptation and music by Piers Chater Robinson, and now, over 25 years later, his innovative Peter Pan musical score is well known and loved, performed in professional and amateur productions worldwide. With its colorful interpretations of these beloved characters, mesmerizing puppetry, stunning voices, and cute, intimate set everyone is sure to love this production! Sept. 21st - Oct. 14th, 2012 at The Growing Stage's Historic Palace Theatre in Netcong, NJ. "There may be something SPOOKY lurking just beyond the bend!" 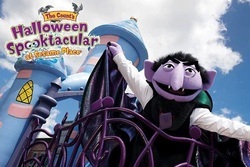 Sesame Place opens The Count's Halloween Spooktacular!! Ok, I know I probably say this every year, but this year it really will be our biggest, spookiest, and most fun Halloween season ever! The park has been transformed into a kid's Halloween haven with amazing new decorations, the ALL NEW Ernie's Rubber Ducky Costume Party, our better than ever Neighborhood Street Party Spooktacular Parade, and our three Halloween shows, Countdown to Halloween, The Not-Too-Spooky Howl-O-Ween Radio Show, and Elmo's World LIVE!- Halloween, (directed by ME). Plus, two interactive mazes, hayrides , pumpkin decorating, and OH SO MUCH MORE. Visit www.sesameplace.com for more information. A vast, belay, yo ho, heave ho to OPENING NIGHT we go! PETER PAN, THE MUSICAL opens at The Growing Stage! I just booked two gigs in one day! Huzzah!! This fall and winter I will be joining The Growing Stage for the first two productions of their 2012-2013 season! I'm so excited! It's a wonderful company housed in the historic Palace theatre in the adorable town of Netcong, NJ. Everyone is so nice. I can't wait to get started! First up, I will be playing a Jukes/Cecco, a pirate, in their production of PETER PAN, THE MUSICAL! The show opens September 21st and runs through October 14th. Yesterday, I shot of scenes for a new show on the SyFy network, "School Spirits." The show tells stories about encounters with the supernatural in school settings. I play a runner on a cross country team! The main character in this particular episode, Chris, was a big track and cross country star before he saw this ghost and I played a runner on his track team. Fitting, as I ran cross country in high school and even captained the team my senior year. I even got to stay after I was done shooting my scenes to help fill the background in some other scenes! It was a great experience! Thanks to everyone at Jarrett Entertainment Group for a terrific day! Be on the look out for information about when the episode will air! 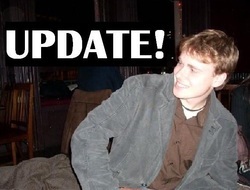 Ok I know it’s been a while since I’ve updated the website. Sorry about that! I moved up to the Big Apple, New York City for the months of January and February. Many thanks to the great Calvin Thompson for letting me sublet his room and my wonderful friend Meredith Beck for the tip off. While in NYC, I began taking voice lessons with the terrific D. Michael Heath. What a wonderful experience! He’s so positive and his approach is direct and effective. I also took an “Audition Therapy” class with amazing Richard Sabellico. Life changing! Richard completely changed the way I think about and approach auditions. I am now so excited to go into the room and do what I’ve worked on. For info on D. Michael or Richard visit the Links page and click their icon or just click on their names above! now know that answer to be yes! I will be moving as soon as I can get the proper funds! Check out my new and improved MEDIA PAGE! It has a new look and FIVE new videos from my past work. See clips from Peter Pan- A Musical Adventure, Hairspray, my senior recital, and much more! Or visit my YouTube page by clicking HERE. Thanks to the great videographers and Erinne Aicher for helping put this together! Or 2013... or even 2011!